For those who are not actively interested in cutting-edge technologies, it is still difficult to imagine that printing of real items such as sports shoes, car engines, residential houses or even human body tissues is far from being science fiction. Researchers intensively investigate and develop new 3D printing technologies, and propose new potential applications almost by the day. “World statistics show that 3D printing is most commonly used in the automotive industry (about 30 percent of products), as well as for prototype advancement (16 percent), for innovations (11 percent), in order to improve efficiency (10 percent) and to reduce prices (9 percent). 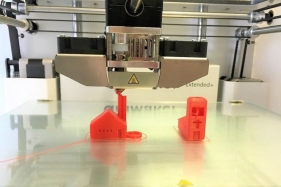 Lithuanian scientists are contributing to the development of these technologies by creation of a new generation of 3D printers and innovative printing materials” says Kęstutis Šetkus, the Director of the Agency for Science, Innovation and Technology (MITA). Senior researcher of the Department of Laser Technologies of the Center for Physical Sciences and Technology (FTMC) Dr. Genrik Mordas says that FTMC specializes in the production of metallic parts by applying laser technologies. "We have an industrial 3D printer that operates on the principle of laser sintering when metal particles are fused in layers until the metal object of desired shape is obtained. We use this printer in our research. So far, metal printers are capable to produce one element from just one kind of powder. However, specialists from the Department Laser Technologies of FTMC are building an innovative 3D printer that will allow to combine different metals to print a single item, so you will be able to have it made of different metals, such as a heat exchanger made of stainless steel and copper. It would be much faster and cheaper to 3D print items instead of using traditional production technologies,” says G. Mordas. Interestingly, the world's largest car manufacturers already have 3D printed engines, and the world‘s first stainless steel pedestrian bridge manufactured with 3D printing was erected in Amsterdam last year. Open R&D Lithuania is an open network for research and experimental development under the guidance of MITA, bringing together all state universities, research institutes, science and technology parks and open access centers, that helps the most advanced Lithuanian technology researchers meet our country’s and foreign entrepreneurs, promotes their collaboration. It is the largest network of innovation infrastructure, services and expertise in the Baltic States, providing more than 2.5 thousand services in the fields of engineering and information technology, biomedicine and biotechnology, materials sciences, physical and chemical technologies, natural resources and agriculture. For successful cooperation between science and business, MITA has established the Open R&D Lithuania Contact Center. It helps businesses find the right people in science institutions faster, find out where to order the services they need, and schedule individual meetings.